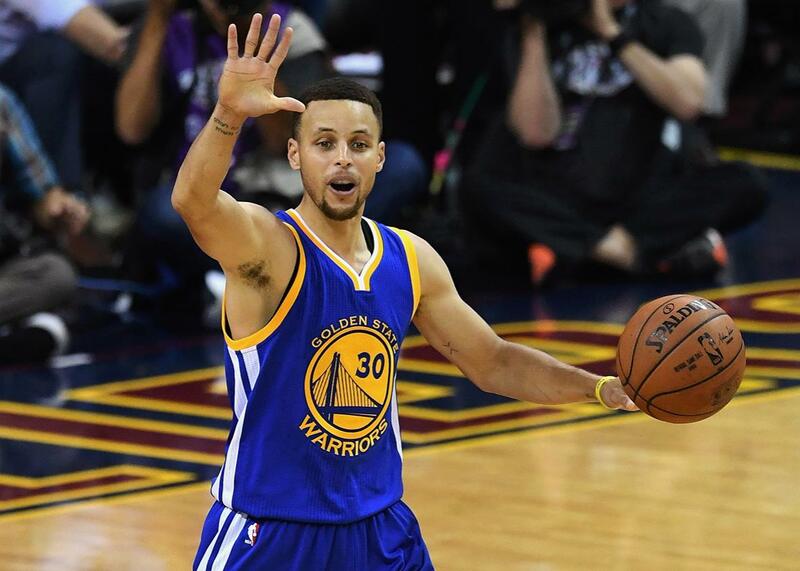 Stephen Curry is challenging the worst, most durable stereotypes about black athletes. The Warriors star is forcing fans and his fellow players to confront their assumptions about black athletes. Stephen Curry of the Golden State Warriors dribbling against the Cleveland Cavaliers in Game 4 of the 2016 NBA Finals at Quicken Loans Arena on June 10, 2016 in Cleveland, Ohio. There is no shortage of allegorical overtone to these NBA Finals pitting LeBron James’s Cleveland Cavaliers against Stephen Curry’s Golden State Warriors. Take your pick. You might frame James as a Goliath to Curry’s David. (Or is it the other way around?) You could interpret the prospect of back-to-back Warriors championships as the triumph of team basketball over one-on-one heroics. Or maybe you see something else entirely. Suspicion surrounds [Curry] because of his light skin, and because he’s been lauded by both the NBA and media establishments. The subliminal message has become explicit: Curry is a brother we may not be able to embrace because the powers that be embrace him too. Curry is not the first black man who makes some black folk uneasy because America loves him as much as we do, but he may be the most popular contemporary figure evoking that dilemma. And Curry’s color is at the heart of that dilemma. In any light-skinned vs. dark-skinned clash, I count myself as a conscientious objector. Full disclosure: I’m a brother the shade of a faded penny, one that’s insufficiently lustrous to catch your eye on the sidewalk unless the sun strikes it just right. I’m possibly not dark enough to suffer any particular stigma beyond the standard one ascribed to black folks, but I’m not light in such a way that might attenuate that stigma. Still, in the case of Steph vs. LeBron, I confess to a partisan interest. I’m hoping Chef Curry roasts the state of Ohio rotisserie style. I’m rooting for the privileged, light-skinned guy to enshrine himself as an NBA immortal, for the splashier of the Splash Brothers to dash water all over the myth of blackness as a monolith. When I root for Curry’s success, I am not interested in affirming the supposed superiority of the light complexioned. I reject the notion that identifying with Steph more than LeBron constitutes aligning one’s self with whiteness. Instead, I relish Curry’s rise because of its potential to illustrate that blackness contains multitudes. He has fallen into a strange place in the American racial cosmos. Too easily accepted by white people to be fully embraced by black people, Curry also represents a rare case of white folks being wrong about a black guy in ways that exalt rather than diminish him. That LeBron James was able to overcome the odds and become the best basketball player of his generation is an objectively tremendous feat, but his story is also a familiar one. In many ways, he’s a composite of black stereotypes: born to a teenage mother, raised without a father in the inner city, surpassingly strong and fast with surreal hops. The reality is that his success is as much a consequence of his legendary work ethic and shrewd decision-making as his unprecedented mix of skill, size, and agility. Nevertheless, he’s seen as a passive beneficiary of a genetic lottery, a once-in-a-generation physical specimen who merely had to lace up shoes to actualize his predestined dominance. This narrative, however reductive, positions LeBron as an avatar of a particular type of black uplift, the kind of rags-to-riches tale in which you can pull yourself up by your high tops only if you have the kind of bulging biceps that scant few of us can hope to inherit. LeBron is the outlier who poses no threat to the status quo, the hopelessly unreplicable aberration that commentators like Stephen A. Smith love to chastise black youth for seeking to emulate. Steph is something else entirely. I first developed a liking for him in 2008, when the diminutive guard led tiny Davidson College on a Cinderella romp to the Elite Eight of that year’s NCAA Tournament. Watching the baby-faced kid with a slight build and pedestrian run-jump athleticism light it up on the big stage was inspiring to all of us genetically less fortunate also-rans. But what really made an impression on me was his performance at the podium. The 20-year-old Curry spoke and conducted himself in a way that reminded me of my parents, my three brothers, and my sister. The kinship I felt with Curry in his amateur days was based in something more nuanced than what we typically think of as class identity. He was the privileged son of a famous multimillionaire while I descended from working-class Midwesterners, but we were both raised by humble, albeit ambitious, upwardly mobile black couples with like values. He was sharp and poised, but he didn’t sound like what white people perceive as the archetypal inner-city black dude. He sounded like I sound. The tendency to underestimate Curry’s skills—his now-infamous failure to secure a scholarship to a major college basketball program, and the fact that point guards Ricky Rubio and Jonny Flynn went ahead of him in the NBA Draft—also rang familiar bells. When I was a casual teenage baller loitering on the blacktop trying to get next, I faced the assumption that if I didn’t drop my g’s then I probably couldn’t drop you with my crossover. The consensus that I somehow didn’t “look the part” benefited me on the schoolyard—the element of surprise is always an advantage on the court—but I was always a little rankled by the conventions that said I didn’t belong on the court. The game of basketball has a unique place in black American culture, and being accepted on the playground carries undeniable social and cultural weight. Having your hoops bona fides continually questioned feels different than being told you aren’t the best fit for center field. Even as the best player on one of the best teams ever, Steph still has to deal with peers who think he doesn’t quite fit in. In the Western Conference Finals, Oklahoma City Thunder superstar Russell Westbrook memorably snickered at the suggestion that Curry was an underrated defensive player. This was a condescension I know well. Here was one of the game’s brightest stars, casually dismissing the NBA’s first unanimous MVP like an off-brand impostor, a guy who’s unwelcome at the cool kids’ table. This is not to domesticate Curry or his game, to commit the common fallacy of writing about him as if he were somehow relatable and not every bit the athletic freak that LeBron is. You wouldn’t be alone in mistaking his meteoric rise for being “relatable—duplicable, even—because of both his skillset and stature,” as USA Today put it, but that’s hardly the case. The suggestion that Curry isn’t himself a genetic anomaly is laughable—you’re not hitting 402 three-pointers in a season if you’re not born with the hand-eye coordination of Green Arrow. But the durable misconception that Steph’s all-world handle and historic shooting ability come solely from tireless toil in the gym is refreshing, as tall tales go. It’s a rare instance of black athletic excellence being appreciated as a reward for diligence, sacrifice, and commitment rather than the abundance of fast-twitch muscles. It’s a step in the right direction for American culture that a black superstar can be celebrated as a super striver and not just a happy accident. I’m happy, then, to see someone like Curry arrive as a face of the NBA, because it’s not the kind of face you’d expect to see on basketball’s Mount Rushmore. A face like Steph Curry’s is one that black Americans are often suspicious of and that white people don’t always believe exists. He forces all of us to confront our mindlessness. He is a light-skinned creature of privilege who shoots threes in your eye and shimmies back up the court. He is a black man being credited for his work ethic at the expense of his God-given talents. He forces the basketball-watching public to confront the fact that the black experience is hardly binary—that an athlete’s appearance and his cultural allegiances don’t always correspond so neatly.